Wholesome honest pet food. All-natural beef hide. Really chewy!. Great for my teeth!. Rawhide, Rice Flour, Additives: None! Feeding Guide Feed one chew daily as a treat or training aid. Adjust your dog's total food intake to allow for these chews and always ensure access to plenty of fresh drinking water. Not suitable for puppies under 9 months (smaller breeds) or 6 months (larger breeds). Don't leave your dog alone with any toys, chews or treats. 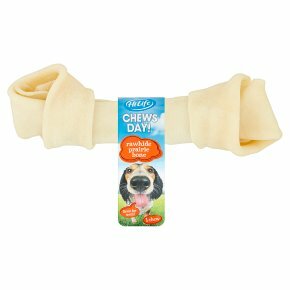 As these chews are made using natural ingredients, their colour and texture may vary.